A few weeks back I started writing out something about metaphors, euphemisms, analogies...you know. 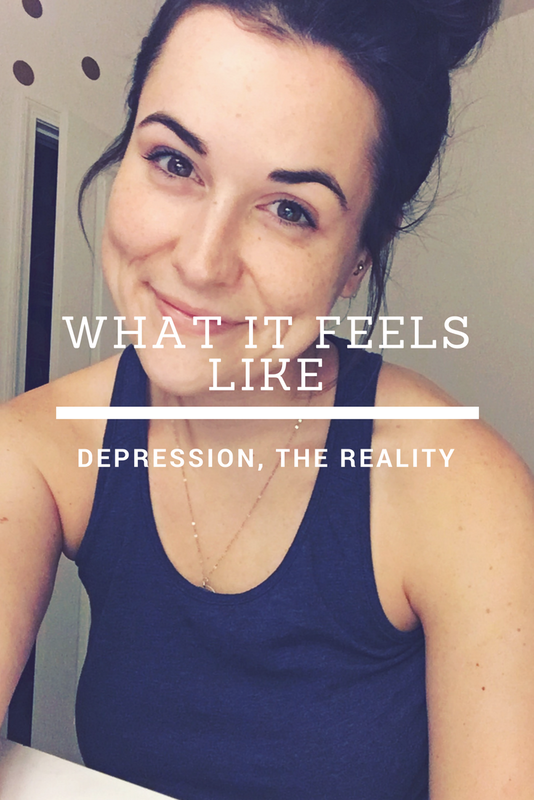 I wanted to say something about how we talk about depression, anxiety, and mental health. I wanted to talk about why we describe it the way we do, and what that does, for those that understand those metaphors, and those that need them so that they can understand. I'm not quite sure I've hit the nail on the head, but I wanted to finally hit publish anyways. Sometimes I am reminded that people don't really know what it feels like - what depression feels like. I remember usually when I am on the other side of things, and it just becomes so clear again how hard it is to articulate. I think so often we hear things like, "it feels like darkness. It feels like hopelessness. Depression is being at the bottom of an empty well. It is sadness." And every time I come back to the fact that, all that? It's not doing me, or anyone else any justice. That isn't serving to make my reality any more clear to people who have never actually experienced depression or anxiety. And moreover, when I am unable to communicate to them not just what it feels like, but why it leaves me so physically useless, I am not helping anybody. So I figured, if I can articulate something now, I should. I should at least try. Because that's gonna benefit you more than anything else. It is going to give you a little window into what my brain does, and maybe give you some more room to empathize, or a better idea of how to help someone else. It aches in my entire body. There is a weight that sits in you, and kind of just presses on your chest. It is humiliating some days; to be the person that doesn't text back, and can't do the dishes, and definitely cried while brushing her teeth. Sometimes there is just a giant vacant hole in your chest, and it is sucking little pieces of you away. And it doesn't feel like anything anymore. It doesn't feel like it's time to cry, or be mad. It just feels like you are supposed to lay in your bed and stare at the curtains and wait for that little black hole in the center of your chest to swallow you whole. I am - on the best of my worst days - about 30% of myself. It's a lot of guilt. To be the burden on people, to be the snail in the room, to be the person that can't go to the grocery store. There's a lot of feeling bad for yourself for feeling bad. Food doesn't taste good. Eating doesn't help. God becomes really confusing. The fact that Someone made your brain this way...it is crushing. You feel betrayed. You feel so slighted, that He chose your brain. You feel so mad that He thought you were capable of handling this constant throbbing sadness. It pulses through your body sometimes. It gets hot in your chest, and you feel it just...pulse through you. That's usually when you feel the hole open up I think. One last thing...sometimes, it just lifts without you even knowing it. Sometimes it is just your day to get a free Starbucks. Or someone finally gave you a hug. Or you ate pizza and didn't feel guilty, or nervous. Sometimes it just passes. I wanna say, before I keep going, I've mentioned that the fall was hard. It's not the fall anymore. And I'm in a great place professionally, personally, financially - I'm living a good life. Like I've said before, like I'll say again, the times to talk about how, why, and when it hurts, are when it doesn't hurt. It's so much easier to articulate that now, when I'm on the other side. When I cry driving to and from work every day - for no reason - seriously, I have found myself sobbing, in my car, and not knowing why. I know I am scared, and anxious, and worried that I am ruining everything but I have no evidence or reason to believe that - when that happens, I can't tell you how that feels. Because I don't know how to say to you that I feel completely shattered, and almost like I am slowly just...evaporating. But when I am here, and I can look at those days...it's easier to explain the hole I get in my chest. And I think one of the most common things I have run into since opening up this discussion is this notion that depression is a technical way to say "sad." I am sad when I finish the last slice of cold pizza. I am sad at the end of every season of Grey's Anatomy. I am sad when I look at my credit card bill. When I literally talk myself through getting out of bed, taking off my clothes, getting into the shower, washing my hair, getting out of the shower, pulling on the same sweat pants, and getting back into bed - with tears streaming down my face - whispering to myself that it's going to be okay, one more step, just wash your face, one leg at a time, there's your bed. 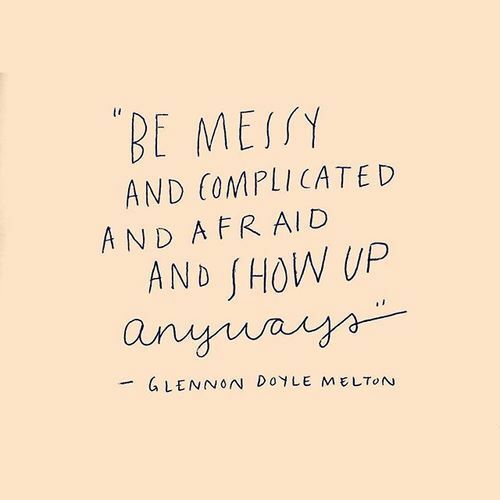 The pain that rips through me when I realize again that this means I have missed plans, or backed out of something, or let someone down - the guilt that that doubles down on - that is not sadness. Mind you, I know that many people have not had this experience. I am so damn thankful that many people have not had this experience. Every time I give my talk on why my platform is so important - that's the kicker, right there. That those of us on this side of the fence literally cannot tell you how it feels to be there. And if you have never been here, you just don't know. We know you don't know. We know that we don't often have the language to explain it to you. Which is where my platform comes in - at least for me. At least for me, it is has been important because that discussion is so complicated. It has been the key that has unlocked every single public conversation that I have had about depression, anxiety, and general mental health. I know it's not fun. I know no one walks away from something like this and says, wow that was great! It's not great. And to someone in your life, there are days when it is everything.